We’re about to head into the holiday season which means many things to different people. But if there’s one common denominator it’s probably that this time of year is known as the season of giving. People open their hearts and make donations to a variety of different charity drives. If you’re in charge of a charity drive, whether you’re collecting food, clothing, coats, or toys, you’re going to have a lot on your plate. A big part of planning and organizing a charity drive has to do with the items you’re collecting. Where are you going to store it all? A.B. Richards can help you work out the storage problems associated with your charity drives. Unlike storage facilities which require you to drag all of the items you’re storing all the way across town, A.B. Richards will bring our portable storage containers right to where you need them. We know how valuable that is for your charity drive and we want to give you some ideas for your drive as well. The Corporation for National & Community Service gives tips to organizations planning charity drives. When in the early stages of planning, organizers should determine where you want to collect the clothing or goods. You also need to develop the actual guidelines for what you’re collecting. Many charitable organizations have rules for what types of donations they’ll accept, for example, wrapped vs. unwrapped toys. You’ll also need to set up collection areas, which could be on a street corner or other public area or at a business or building lobby. You also need an area to store what you collect. A.B. Richards can bring a portable storage unit to serve as your main collection area or bring multiple portable storage containers to various collection sites. If you need to bring one of our units to a congested or difficult to access areas, our 20ft storage containers are ideal. This versatility makes it one of our most popular products. 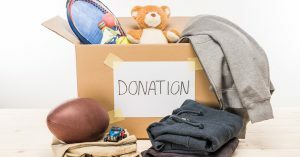 When you’re finished collecting your goods and you’re ready to donate them, it’s once again important to make certain that you’re complying with the guidelines of the charitable organization you’re working with. Be certain to wash clothing and clean any household items that you may be donating. It’s also important to keep good records of what you’re donating. Catalog all of your items and keep track of what’s in what box. It’s probably a good idea to label those boxes, if you’re storing multiple items and consider color coding the labels. Store bigger items on the bottom of your portable storage. If you’re going to need to access some items more quickly or more often put them in the front of your storage unit. Putting together a charity drive is a great way to contribute to your community, but you need to keep things organized. A.B. Richards gives you the storage space you need to make your drive a success. We can drop off your portable storage containers wherever they’re needed. To get started, contact us today.